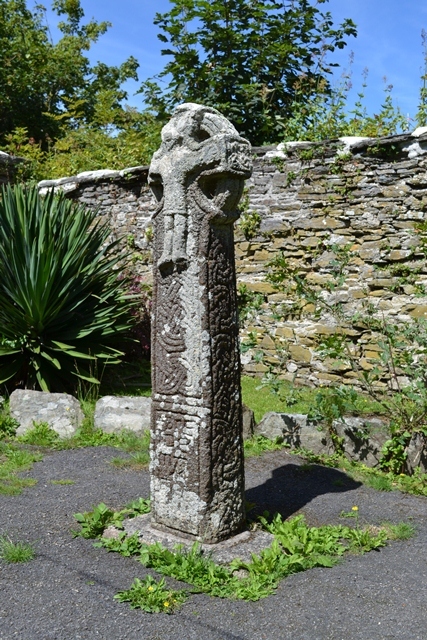 The Churchyard Cross stands inside the churchyard near the Church's south porch. It is an important example of an early Celtic Cross and its head is thought to date from the 10th century, from the time of King Athelstan. for the five wounds of our Lord. The steps on which it now stands are 18th century. Acknowledgement for the large picture of the Cross above and the written information below is due to Ann Preston-Jones. 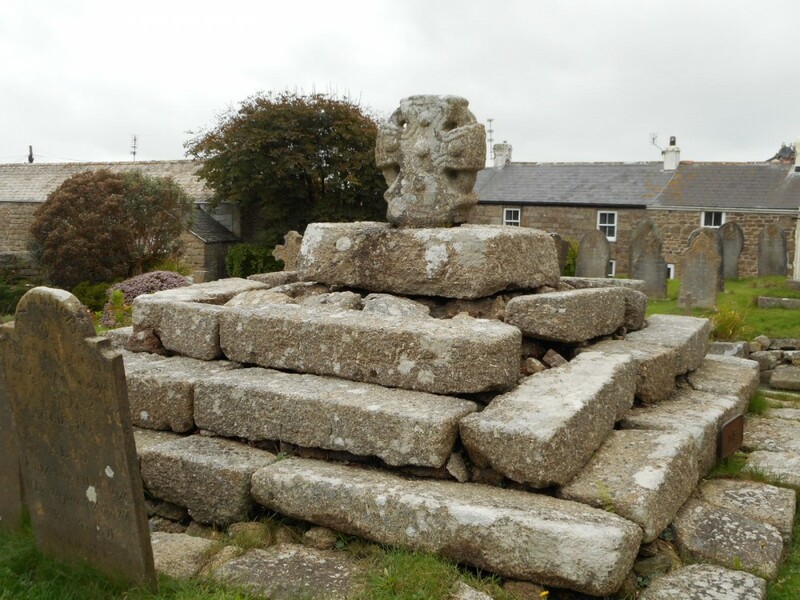 The churchyard cross seen today beside the south porch of St Buryan Church is a composite monument with stonework of several periods. The head is part of the original 10th century churchyard cross; the stepped base may date from the 15th or 16th century, and to this a fifth step was added in the late 19th century. It is likely that the cross-shaft was cut off and re-used as building stone in the 15th century when the church was extended and rebuilt. By then its decoration was out-of-date, and the shaft could easily be re-used, whereas the Crucifixion on the head remained a recognisable and significant image. The same happened at Paul, where the cross-head is now set on the churchyard wall and the shaft can be seen built into the north wall of the chancel. The stepped base is a typical feature of churchyard crosses of this period, although the re-use of a 10th century cross-head in this context is unusual. A more typical 15th century churchyard cross can be seen at St Mawgan Church, close to Lanherne. The churchyard cross is first recorded in the late 18th century. The early illustrations and descriptions suggest that at first it had only four-stepped base; the lowest, fifth, step appears to have been added in the late 19th century  and the smaller size of the stones used helps to confirm that they may be a later addition. 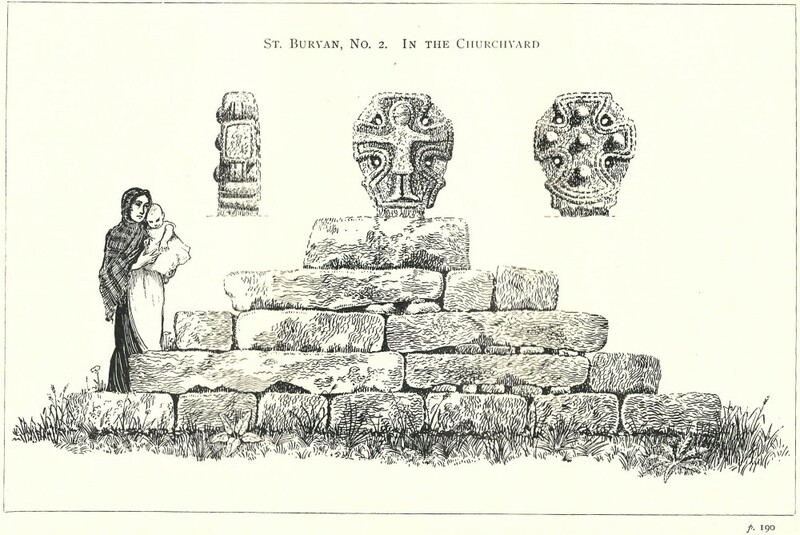 St Buryan was the principal pre-Norman church of the Land’s End (Penwith) peninsula, and is first recorded in a charter of the first half of the 10th century. In all probability this charter represents a confirmation of the existence of a pre-existing religious house since the saint, Berion, is recorded earlier, in a tenth-century List of Cornish saints. In Domesday Book, the church of St Buryan was held by the Canons of St Berrione and it remained a collegiate church throughout the medieval period. The monument is likely to have been carved and set up as a focal point of the re-founded collegiate church. As a major feature of the most important church in the area, it is likely to have been influential in the development of sculpture locally. As mentioned above, other similar monuments can be seen at Sancreed, Paul, and Lanherne, as well as St Erth and Phillack churches. Another relic of Athelstan’s college is the fragment of a coped grave-stone on the left side of the path to the church door. This is decorated with foliage scrolls and a key pattern, although the carving is very worn. A Preston-Jones and E Okasha, 2012, Corpus of Anglo-Saxon Stone Sculpture Vol XI, Early Cornish Sculpture, 88-91. 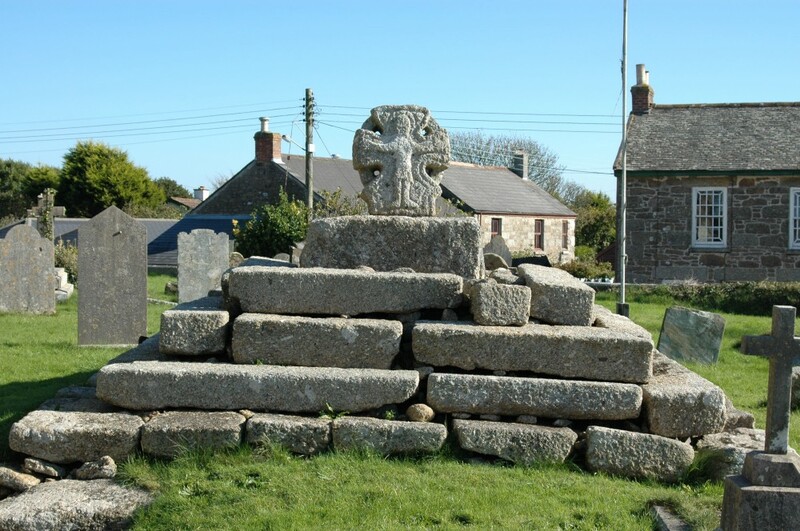 For example: JT Blight, 1856, Ancient Crosses and other antiquities in the West of Cornwall, 17. See AG Langdon, 1896, Old Cornish Crosses, plate opposite p 190. N. Orme, 2010, The Victoria County History of the Counties of England: A History of Cornwall, Vol II, Religious History to 1560, 128. BL Olson and OJ Padel 1986, . ‘A Tenth-Century List of Cornish Parochial Saints’ Cambridge Medieval Celtic Studies, XII, 48. 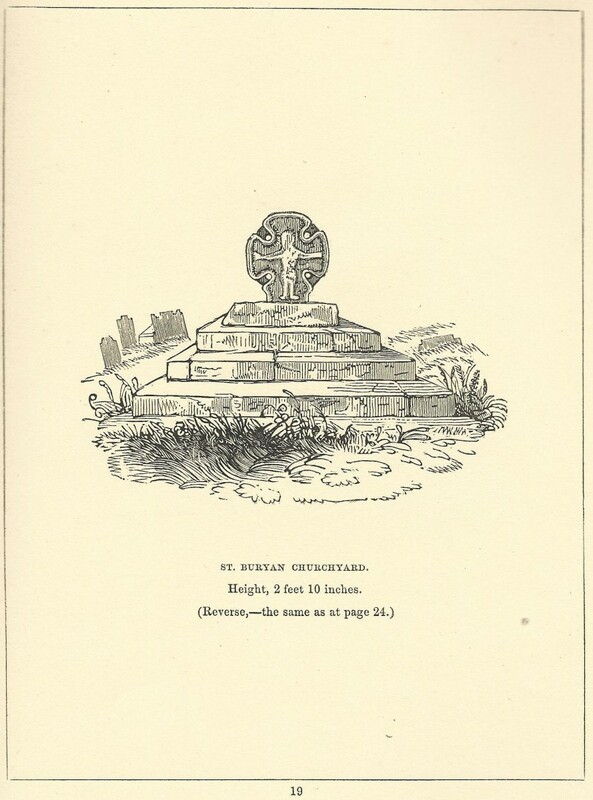 Henderson, CG, 1925, Cornish Church Guide, 34-6.
below: St Buryan Cross in 1896, Langdon.